HOME > Browse > Rare Books > Landmark Books > An Essay on the Principle of Population; or, a View of its Past and Present Effects on Human Happiness; with an Inquiry into our Prospects Respecting the Future Removal or Mitigation of the Evils which it Occasions. MALTHUS, THOMAS ROBERT. An Essay on the Principle of Population; or, a View of its Past and Present Effects on Human Happiness; with an Inquiry into our Prospects Respecting the Future Removal or Mitigation of the Evils which it Occasions. 4to. Contemporary half calf, morocco spine label. Upper joint cracked but securely held by cords. An excellent copy in a period binding. “In 1803 Malthus published under his own name the stout quarto that embodies his mature views of his subject. The author confesses in his preface that he had taken too gloomy a view of human nature in his first essay… The achievement of Malthus was the exposition of the theory of population; and his name has been associated so closely with this theory that, like Darwin’s, it has added a new adjective to the language of civilized peoples” (Palgrave). “Malthus was one of the founders of modern economics. His Essay was originally the product of a discussion on the perfectibility of society with his father, [who] urged him to publish. 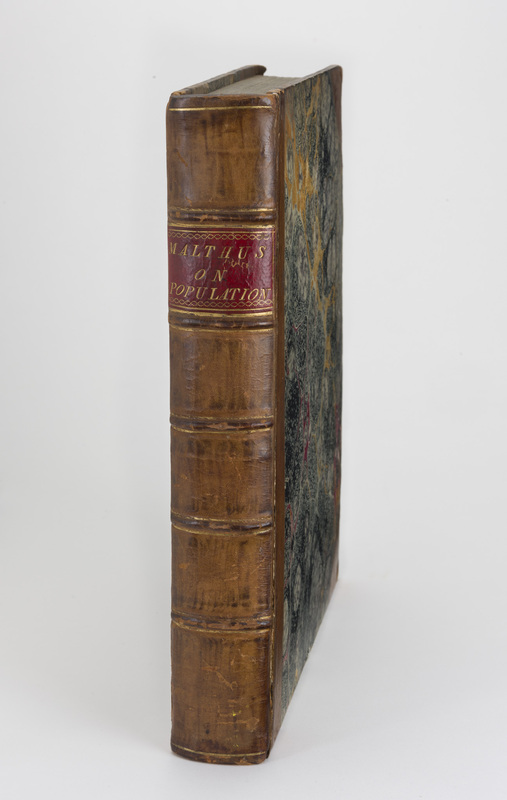 Thus the first edition (published anonymously) was essentially a fighting tract, but later editions were considerably altered and grew bulkier as Malthus defended his views against a host of critics” (PMM). “Whereas in the first edition he had said that all the checks to population would involve either misery or vice, in the second edition he attempted to lighten this ‘melancholy hue’ … and ‘to soften some of the harshest conclusions of the first essay’ … by arguing that moral restraint, if supported by an education emphasizing the immorality of bringing children into the world without the means of supporting them, would tend to increase rather than diminish individual happiness” (ODNB). “The Essay was highly influential in the progress of thought in early 19th-century Europe [and] his influence on social policy was considerable… Both Darwin and Wallace clearly acknowledged Malthus as a source of the idea of ‘the struggle for existence” (Printing and the Mind Of Man). This heavy and much-read book is usually found rebound or rebacked. This is an excellent copy in a period binding.